In Japan, people visit their ancestor’s graves and pray with their family on “o-higan” days (equinoctial week). It is one of the events of Buddhism and the period of seven days around the Vernal Equinox Day or Autumnal Equinox Day. This custom is proper to Japan. 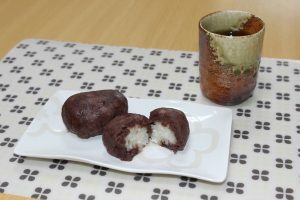 People offer the rice cakes covered with sweet red bean paste for O-Higan. They change the way of calling the rice cake depending on the seasons. In autumn, it’s called “ohagi” which named after the shape of the flower of “hagi” (a Japanese bush clover). And then, in spring, it’s called ”bota-mochi” which named after the shape of the flower of “botan” (a peony). Wash the rice and add the water and sugar. Put it for 1 hour and then, steam the rice by a rice cooker. When it’s done, mix it lightly. Mush half of it with a wooden pestle. Put the beans up to a colander and wash in the water. Put it in the pressure cooker and add three times amount of water to adzuki-beans and heat it under pressure. When it boiled, heat it on low heat for more 10 minutes and remove it from heat. Finally, put (Direction 7) on the palm and spread out. Put the rice cake on it and covered with it. Then, it’s ready to eat!! If it is too sticky to handle the adzuki-bean paste on 7 or final direction, you can use cellophane film. It’ll be much easier.